It’s not uncommon for racers to sail multiple boats or one-design classes. If you’re looking for the right fleet or to expand your experience on different boats, Quantum’s Travis Odenbach offers some tips on getting up to speed on a new platform. Spicing things up - Quantum's Travis Odenbach sails with his J/70 HoneyBadger. Photo by Phil Pape. With a multitude of one-design boats on the market, there is a boat and fleet for everyone–and in many cases more than one! I’ve spent time on multiple boats throughout my career, but I focused mainly on the J/22 and J/24 classes. More recently, I turned my attention to the J/70s, and it’s been fun looking at things anew after so many years of sailing. Understanding different boats can diversify any sailor’s abilities and broaden their toolkit. The one-design platform is set up and designed differently, but the same fundamental principals of sailing can apply when stepping onto each boat. Switching back and forth can give you a new perspective and help you become a better sailor overall. As I mentioned, I recently started racing seriously in a new class, the J/70s. Approaching the J/70 was a bit overwhelming at first, and I was forced to take a step back and think about how to approach the challenge strategically. It was no small feat, but the crew’s patience and flexibility things paid off. 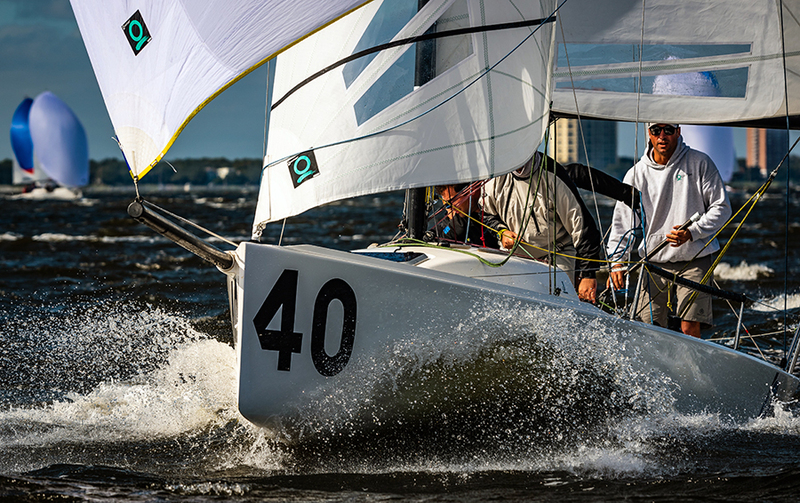 We were able to not only win the J/70 class at the 2019 St. Petersburg NOOD Regatta, but we were also crowned the overall winner. Here is how we made the switch and a few of my tips for how to go about the change. If possible, take the same crew with you when switching. Having a familiar crew had a lot to do with our success in St. Petersburg. Having a crew that sails together regularly will help mitigate the adjustment period to a new class. A crew that is familiar with each knows one others’ skills, roles, and personalities, so the process of working together to get the boat going is more efficient and fun. Remember, this is supposed to be fun, so enjoy the time learning together and keep your expectations realistic. Due to the variations in design, especially when it comes to the hull, different boats will behave differently in the water. For example, a J/24 will actually coast through the water longer than a J/70 when sailing head-to-wind, so one-to-one on your box will most likely not work in this fleet. A J/70 will stop quickly and take a long time to speed up again, so one-to-one on the box most of the time works in this fleet. It’s important to have a good feel for these differences and understand what you’re working with so that you’re able to plan and react to conditions and situations accordingly. The key is to become comfortable with how each boat reacts in all conditions before jumping into a regatta. I recommend trying to ping a starting line and doing a two-minute drill over and over. Practicing isn’t just important leading up to the first regatta, it’s important to do onsite, too. Get used to how the local conditions affect the new boat. If you want some tips on how to practice before a regatta, check out Quantum’s Doug Stewart recommendations. Make rig tune an absolute priority regardless of platform. Take time to look through notes published by your sailmaker and from class experts, and go through the boat to make sure everything is where it is supposed to be. Once comfortable, spend as many days practicing as possible. Enlist a tuning partner against which to test speed and rig tune. It usually takes at least a day to feel comfortable with all the different modes upwind and down. It also helps to familiarize yourself and your team with the setup and mark the boat with repeatable guides once you get your settings dialed in. Even something as seemingly minor as having new line colors to think about can throw you off in the heat of a race. Anything you can do to mark sheets, lines, halyards, deck, and backstay will help you execute faster and more smoothly. Keep an open mind and ask experts for help. You are not alone! Quantum has a robust one-design team and experts in just about every class competitively sailing today. Their number-one priority is to help you get answers to your questions and navigate the learning curve. I’m a seasoned racer, but I’ve had to remind myself many times to stay out of my own way and to be open to others’ ideas and set aside my theories about the boat. Asking for help and using available resources have been an important part of my success. In addition to a team of experts, Quantum also has a deep library of articles and videos to help. You can find the whole collection at quantumsails.com in Resources & Expertise. You can also narrow down options by category and topic. Doing research and getting answers from the experts are key, but spending time in the boat is really the determining factor in getting up to speed with a new platform. The more time you can spend on the boat and sailing with your crew ultimately results in a higher comfort level for the program. Most importantly, get out on the water and have fun. This is sailing after all!